The Tennessee Smokies Wednesday afternoon revealed their new logos, colors and uniforms for the upcoming 2015 season at a press conference at Calhoun's On The River in downtown Knoxville. 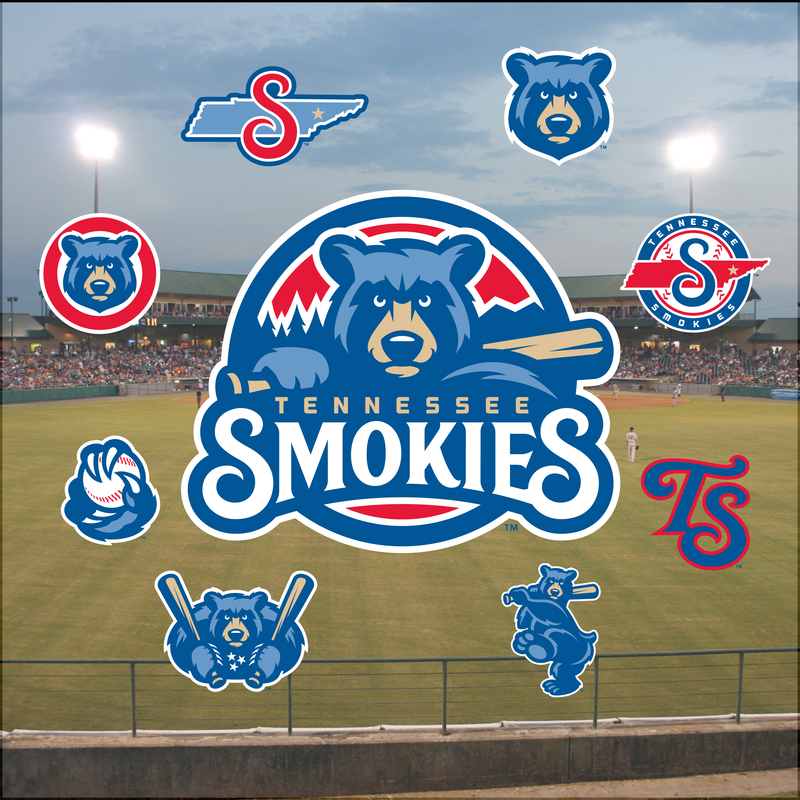 The new primary team logo comprises of an intimidating blue bear resting a bat on his back shoulder, with Great Smoky Mountains National Park represented with trees and mountains, along with a red background and "Tennessee Smokies" written underneath the bear. Additional logos include a rebranding of the script "TS Logo", "State S Logo" and "State Circle Logo" as well as the introduction of a "Bear Head Logo" that will be worn on the team's uniforms and road hats, along with new word marks. Several other alternate logos with use of the blue bear include the "Batting Bear Logo", "Bear With Bats Logo" and the "Four Seam Logo" of a bear claw holding a baseball with a four-seam fastball pitching grip. The "Bear With Bats Logo" features the Smokies' blue bear holding a pair of bats, and incorporates the three stars from the Tennessee state flag on the bear's chest. "We are very excited with these changes as we enhance our brand," said Smokies Vice President and COO Chris Allen. "We have maintained the elements of our local community from our previous logos, including the Great Smoky Mountains, while creating a sharp, updated look to the franchise." 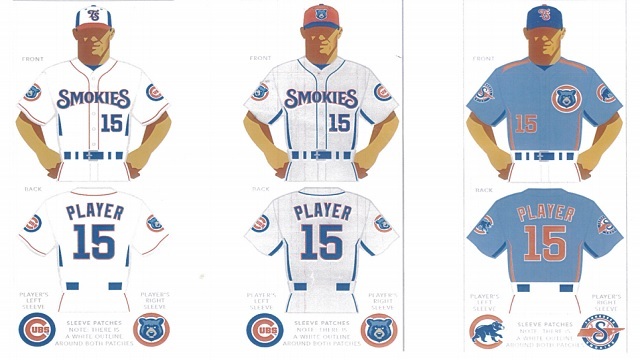 The team's primary colors, along with the lettering and numbers have also been changed to reflect the Smokies' parent club, the Chicago Cubs, with Royal Blue, Light Blue, Red, and Tan as the team's new colors. The Smokies have been the Double-A affiliate of the Cubs since the beginning of the 2007 season, with the two teams announcing a four-year extension earlier during the 2014 campaign. Under that current deal, the two clubs will be aligned through 2018. "Matching our color scheme with the Chicago Cubs further reflects the great partnership we have enjoyed with them since our affiliation with them began in 2007," stated Smokies General Manager Brian Cox. "It's an iconic brand, and we expect to continue our relationship with them for many years." The home white and road gray uniforms remain largely unchanged, minus the updated logos, while the alternate uniform has been tweaked. That uniform features a light blue color with the "Bear Head Logo" in front of a red circle on the left chest. In addition, the road cap will feature the blue "Bear Head Logo" on red stitching. The logos were designed by Studio Simon out of Indianapolis, Indiana, who has previously designed logos for 75 major league, affiliated and independent minor league and collegiate summer league clubs, in addition to official marks for two Super Bowls and two NFL Pro Bowls. Merchandise with the new colors and logos is now available and can be purchased at the Smokies Clubhouse Shop during normal business hours at Smokies Stadium in Kodak, as well as online at www.smokiesbaseball.com. 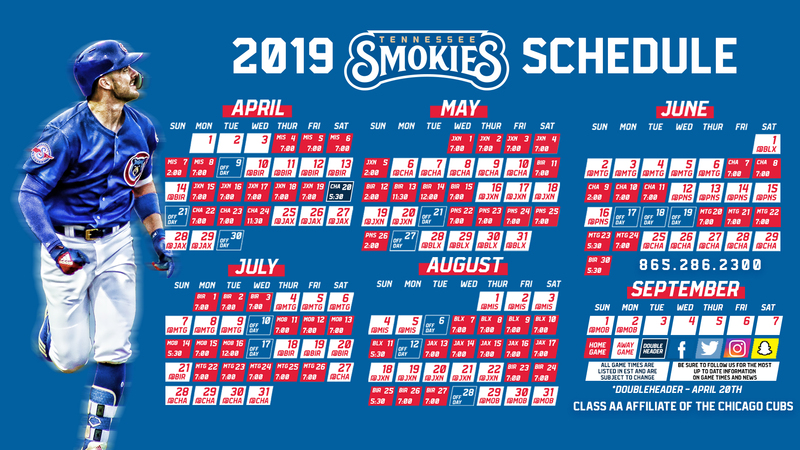 The Smokies' 2015 season kicks off on April 9 in Mississippi, before the team returns to East Tennessee to start their home slate on Wednesday, April 15, against the Pensacola Blue Wahoos, the Double-A affiliate of the Cincinnati Reds. Game times, along with promotions, for all 70 home contests will be announced on a later date. Season ticket packages are currently on sale and can be purchased by contacting the Smokies Ticket Office at (865) 286-2300. Mini plan information will also be released in the near future and fans are advised to check back here for the latest.